Chekhov is also like music in that he’s almost impossible to write about. The historical, cultural and personal allusions are too rich, too fleeting: the plays hit so many synapses that you simply can’t keep up. The only solution: put it on the turntable again and listen for the next unexpected nuances. There are parallels. Notice how the old servant Firs (a wonderful performance by Tobias Andersen) never abandons the cold comfort of serfdom, while the “new man,” Lopakhin (Tim Blough), having left serfdom behind and prospered in the new freedom, takes on the enslaving chains of the land, which the matriarch Ranevsky (Linda Alper) and her clan let fall away. Notice how the snotty servant Yasha (Colton Ruscheinsky) echoes the class-conscious snobbery of the useless brother Gayev (Michael Mendelson). Notice … well, we could roll on and on. This is a well-chosen cast, with fine turns by Todd Van Voris, Val Landrum, Victoria Blake and others. Alper’s warmth and wit lend a budding feminist power to the tale: her Ranevsky is less the foolishly stubborn victim of so many productions and more the forward-looking survivor. 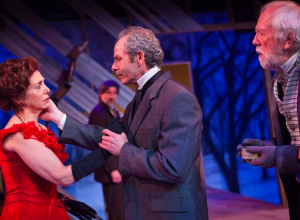 For me, this production pivots on Blough’s deeply sympathetic interpretation of Lopakhin, the butcher’s son turned entrepeneuer whose abiding affection for this nouveau pauvre family leads in a curious way to his own abandonment and loss. I’m accustomed to shuddering at the end as the ax bites into those falling cherry trees. For the first time, I see the land not so much as victim but as victimizer, and the good man Lopakhin, not the trees themselves, being felled. Of course, that’s just the way I hear the music this time around. Next time, perhaps, the violin. Infighting at the classical corral: With strikes and layoffs and a plague of bankruptcies, classical music finds itself in a dilly of a pickle barrel these days. Yet sometimes (warning: metaphor switches dead ahead) the most riveting car crashes are inside the groups themselves: a string quartet can be like a bad marriage squared. I haven’t yet seen Opus, Portland Center Stage’s play about a squabbling chamber group, but Charles Noble has, and he gives it a thumbs up. That means something, because Noble is both an insider — he’s assistant principal violist with the Oregon Symphony and a member of the Arnica String Quartet — and a witty, perceptive observer of the musical scene on his aptly named blog, Noble Viola. And he thinks the thing rings true. Here’s part of what he has to say: “While the discussions in my string quartet are hardly as heated as they become in the fictional Lazara Quartet, the drama very accurately portrays how outside pressures can boil over in the intimate confines of the string quartet. My favorite line from the play: ‘That guy didnâ€™t play music, he extruded notes. Iâ€™d rather make love with a kitchen appliance.’â€ Sounds deliciously dissonant. Battle of the bridge: After many years and many millions of dollars of dithering, the states of Oregon and Washington have come up with their grand plan for reinvigorating the Interstate 5 river crossing between Portland and Vancouver. As announced (but not quite in these words) by the two states’ governors, the plan seems to be: make it cheap(ish), make it ugly, ignore the real bottlenecks on the freeway all the way south to the Rose Quarter, gamble that the feds will come through with a big check, and keep the toll booth in place for the next zillion years. Genius! A few months ago Mr. Scatter gave his own admittedly curmudgeonlyÂ take on the process. But the man who’s really tracking things is Brian Libby, proprietor of the vital blog Portland Architecture. “Now that our leaders have failed in every step of the Columbia River Crossing planning and design process, the rebellion against this multi-billion-dollar boondoggle of freeway and pork-barrel politics can get fully under way,” he begins. “Luckily it’s not just a rebellion to stop something, though, but to find a better way …” Libby has lots to say, and undoubtedly will have lots more. A good idea: keep checking in on him. It’s taiko weekend: Portland Taiko opens its newest season this weekend with Ponta & the Big Drum, a kid-friendly original musical tale about a mischievous tanuki (that’s a Japanese raccoon dog) that keeps gumming up the works while the village taiko players are trying to prepare for the matsuri, or festival. Folk-tale animals are always pulling stunts like this. 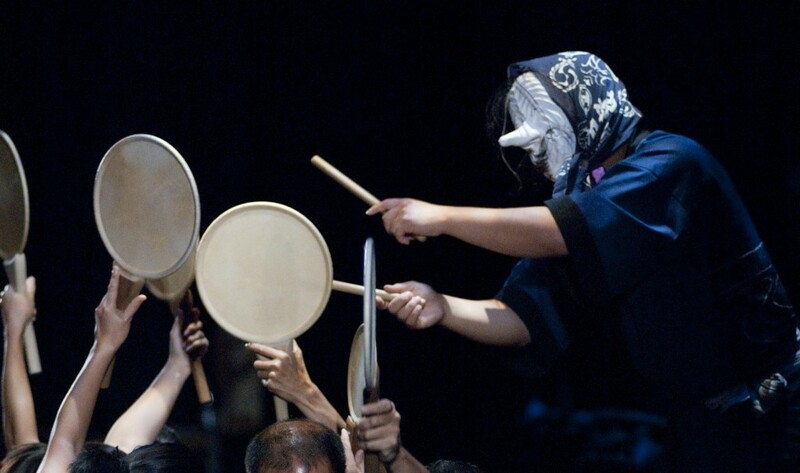 Haven’t seen rehearsals or heard the music, but Portland Taiko has a longstanding tradition of creating a work for family audiences in each of its seasons. No matter what, those drums sound cool. The schedule: 11 a.m. Saturday plus 11 a.m. and 1 p.m. Sunday; same schedule next weekend, May 7-8. It’s in Brunish Hall, the small upstairs theater in the Portland Center for the Performing Arts. Dep’t of complete transparency: I’m on the company’s board of directors. To locavore or not to locavore: Or maybe both. This week’s Willamette Week has a fascinating interview with James McWilliams, the Texas academic whose book Just Food: Where Locavores Get It Wrong and How We Can Truly Eat Responsibly has a lot of local-food advocates in a dither. McWilliams was in town for a talk Wednesday night, and I missed it (something about an endangered cherry orchard). Nor have I read his book: it’s on my list. But from what I’ve read, in this interview and elsewhere, he has a point of view that shouldn’t be dismissed.Â Boiling it down to an overriding single point, he argues that food isn’t just a local issue — as humans, we have a moral responsibility to feed a projected 9 billion people by 2050, and that will require macro as well as micro solutions. Local issues are real: I wince each time I drive past the paved-over flats of the Green River Valley south of Seattle, at one time some of the most fertile farmland in the world; and closer to Portland, the Helvetia area of Washington County is facing the same fate. But 9 billion is a huge number, and as much as I love ’em, there really aren’t that many heirloom tomatoes on the vine. Nearly three years ago Art Scatter approached some of the same issues with this post that touched on rice-farming breakthroughs, Thomas Malthus, Norman Borlaug, the Green Revolution, and Leo Tolstoy. We didn’t come up with any answers. But, like McWilliams, we think it’s high time we start expanding the questions.